We’ve invited one of the leading lights to emerge from the burgeoning lo-fi house scene, DJ Seinfeld for one of his masterful and unpredictable sets. Footage of his gigs or their post-show reaction exemplifies the reception he gets as a DJ. Biographies often claim a DJ regularly ‘sends crowds into rapture’ or ‘lays waste to the floor,’ but in DJ Seinfeld’s case pandemonium is the default. 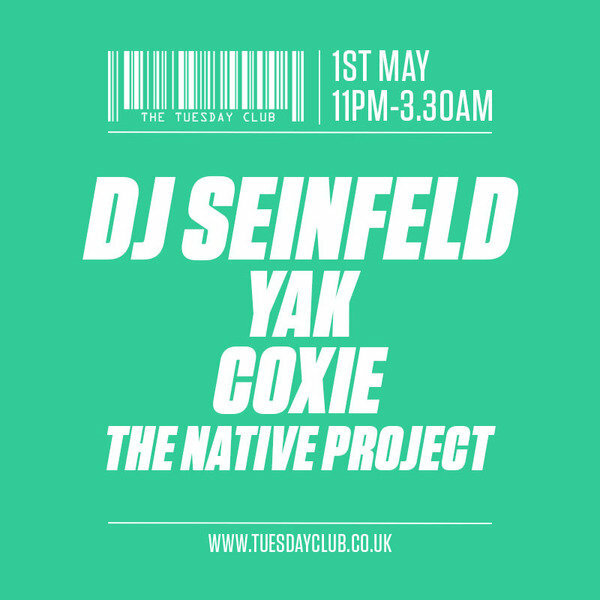 Mixes show his deft control of build-up and feel in the booth, while his miniseries for legendary London station Rinse FM in May ‘DJ Seinfeld presents...’, was a master class in the kind of wonky left-field house he peppers his sets with. With a strong local support from Pretty Pretty Good resident, Yak, underground hero, Coxie, and newcomers The Native Project, this is will be a serious line up for the heads.